Lightly spray both sides of each tortilla with nonstick cooking spray. Press each tortilla into a 1-quart oven safe bowl to form a bowl shape. Place on baking sheet. Bake 10 minutes or until edges are browned. Cool for 3 minutes. Remove tortillas from bowls; cool completely. Tortilla bowls can be prepared in batches. Brown ground beef in large skillet over medium heat 8 to 10 minutes breaking up into 1/2- inch crumbles. Drain any remaining fat. Stir in taco seasoning mix and water according to package directions. Bring to boil. Reduce heat and simmer 5 minutes, stirring occasionally. Remove from heat. Divide salad greens into tortilla bowls. 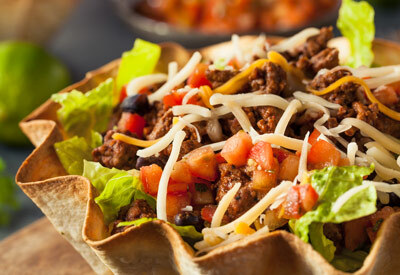 Top with seasoned beef, beans, tomatoes, cheese and any added toppings that you choose.